FSMIS (May 30, 2014): On May 22nd, a legislation became Public Law No. 18-55 for the purpose of appropriating a total of $400,000 from the general fund of the Federated States of Micronesia to provide funding for athletes and coaches from the four States in the FSM to participate at the 2014 Micronesian Games. The appropriation is divided equally among the four States. Share for the State of Yap may also cover expenses for a group of dancers going to an international cultural festival also this summer. The respective State Governors are the allottees for the funds. The signing message from the Executive indicates, "The Micronesian Games continue to promote unity among our island neighbors and foster good sportsmanship in our young people". The 8th Micronesian Games will be held in Pohnpei for ten days, staring on July 20th. The State of Pohnpei had previously hosted the Micronesian Games back in 2002. FSMIS (May 28, 2014): On May 22nd, Federated States of Micronesia President Manny Mori transmitted to Congress a proposed amendment to Section 1 of Article XIV of the FSM Constitution. The proposal is to lower the vote required to ratify an amendment to the FSM Constitution from a 75 percent of votes cast in 3/4 of the States to 60 percent of votes in 3/4 of the States. The President wrote, "Although a bill was introduced in Congress on September 11, 2013, I regret that there has been no action taken on the bill and no committee report filed. If it is approved by the 18th Congress, the constitutional amendment is required to be placed on the ballot, preferably in the March 2015 national election". At the recently concluded State and National Leadership Conference on May 22nd to 23rd, the very issue was part of the agenda. The FSM Department of Justice did a presentation on the proposal showing that this particular constitutional requirement needs revisiting as demographic situations have drastically changed since the supreme law went into effect in 1979. At the meeting, many of the Leaders expressed that the required percentage might have been set at a very difficult, allowing minority control over the preference of a significant majority for too long. "Effective public education is required to prepare the Nation to make an intelligent decision on an issue of transcendental importance. In this regard, it becomes imperative for the national Government to set aside sufficient time a resources to organize and prepare the necessary logistics", President Mori further indicated. For more information, contact the Public Information Office at 320-2548 or email fsmpio@mail.fm. FSMIS (May 27, 2014): As mandated by specific parts of Title 55 of the Code of the Federated States of Micronesia, the FSM Congress adopted a resolution on May 20th that sets the ceiling for total funds estimated to be available in domestic revenue this fiscal year 2014. Congressional Resolution 18-163 states that an amount of $69,098,221 is estimated to be available from domestic revenue during this fiscal year ending September 30, 2014, in addition to an amount of $3,512,158 under funds from the Amended Compact of Free Association with the United States. This estimated amount exceeds the FY14 domestic revenue projection submitted by the President to Congress on April 2, 2013 by approximately $14.8 million. "Historically, the actual revenue collection has exceeded projections and by a wide margin in recent years... Overall, the $54 million domestic revenue projection is not only realistic and achievable but is more on the conservative side", President Mori expressed in his FY14 budget transmittal letter. The recent increase in domestic revenue has been mostly attributed to funds increase realized from Fishery Agreements and tax fees from Major Corporations. In the FY15 budget request submitted to Congress last month, the President asked for a $15 million to be set aside as what has been termed 2023 Investment Fund, an amount he has urged Congress to make available for such fund each year leading to 2023. This amount matches the difference between the revenue projection of April 2013 and what Congress now sets as achievable domestic revenue this fiscal year. FSMR&D (May 26, 2014): The Seventh State and National Leadership Conference (SNLC) took place on May 22nd and 23rd at the College of Micronesia- FSM, Palikir, Pohnpei. During the two-day conference, the SNLC Principals discussed critical issues for the economic and social development of the FSM including: 2023 Framework and Action Plan, lowering threshold of the constitutional amendment, tax system reform, project management unit, fiber optic connectivity, FSM Petroleum projects on renewable energy, air service cooperation, infrastructure development, and overseas development assistance. Leading the respective National and State Delegations at the conference were the FSM President, H.E. Emanuel Mori, Vice President Honorable Alik Alik, Speaker of the FSM Congress, the Honorable Dohsis Halbert, Governors Lyndon Jackson of the State of Kosrae, Johnson Elimo of the State of Chuuk, Sebastian Anefal of the State of Yap, and Lt. Governor Marcelo Peterson of the State of Pohnpei, Speakers Gibson Siba of State of Kosrae, Fernando Scaliem of the State of Pohnpei, House of Representatives Floor Leader Kenruo Nero and Senate Vice-Speaker Isiro Choram of the Chuuk State Legislature, and the Honorable Chief Justices Martin G. Yinug of the FSM Supreme Court, Aliksa Aliksa of Kosrae State Supreme Court and Camillo Noket of Chuuk State Supreme Court. Also present were Members of the National Congress and State Legislatures, National and State Cabinet Members, members of the Diplomatic Missions, representatives from the private sector and support staff. The 7th SNLC was chaired by FSM President Manny Mori. The action and decision outcomes from the Conference are detailed in a Communique and resolutions, which will be available on www.fsmpio.fm. For more information, contact the Department of Resources and Development at 320-5133 or email fsmpio@mail.fm. Palikir, POHNPEI (FSM Information Services) – On Friday May 16th, the Federated States of Micronesia hosted the annual Mid-Year Review of Joint Committee Meeting (JCM) with the United States of America dealing with security and defense issues, as provided under Title III of the Amended Compact of Free-Association. The meeting was held at the Office of Environment and Emergency Management in Palikir and was attended by high-level officials from both Governments. FSM Ambassador to the United States Asterio Takesy, and the Deputy Chief of Mission of the US Embassy in Pohnpei, Miguel Ordonez, headed the respective delegations. As with previous JCM Review meetings, the main objectives were to review updates on the implementation of agenda items agreed to during the last JCM held in the State of Yap and consider other issues to be discussed at the main JCM to be held in Honolulu later this year. The meeting started in the morning of the 16th with a wreath-laying ceremony held at the Pohnpei International Airport to commemorate and honor those FSM citizens who have paid the ultimate sacrifice while in the service of the US Armed Forces. Laying the wreaths on behalf of the FSM was Ambassador Asterio Takesy. Lieutenant Governor Marcelo Peterson participated on behalf of the State of Pohnpei while Mr. Benito Cantero represented the FSM Association for Veterans' Affairs. Deputy Chief of Mission Miguel Ordonez and Captain Mark H. Scovill, Chief of Staff of the Joint Region Marianas, represented the United States Government. The JCM Mid-Year Review meeting commenced in Palikir with an official segment providing opportunities for delivery of remarks by respective heads of delegations. Ambassador Takesy affirmed the importance of the Title III to the relationship between the FSM and the United States and confirmed FSM’s continuing commitment to the principles of the provision. He also conveyed gratitude for the successful consideration of Mr. Michael Saimon to the prestigious US Naval Academy at Anapolis. Ambassador Takesy also called for a moment of silence in honor of US Army Sergeant Bernard Boichan of the State of Yap who passed away on April 29, 2014 in Chapel Hill, North Carolina. Subsequent to the brief opening ceremony, Ambassador Takesy assumed the chairmanship of the meeting. Among the issues considered were the Shiprider Agreement between the FSM and US. Both parties acknowledged the successful signing of the Agreement in March of 2014 and the Construction Civic Action Detail (CCAD) program which continues to provide needed rehabilitation and renovation work for community infrastructures projects. Updates on efforts to improve the Armed Services Vocational Aptitude Battery (ASVAB) Testing and strengthen law enforcement cooperation were also undertaken. In addition, a review of procedural improvement with respect to access of foreign military aircraft and research vessels into the FSM were also undertaken. As a standard item of discussion in the JCM process, updates on the military build-up in Guam were also provided as well as actual work being undertaken by the transnational crime unit (TCU) and the Sasakawa Peace Foundation surveillance assistance program, both of which support FSM's overall maritime security. Aside from the core JCM action items, updates were also tabled with respect to infrastructure projects submitted for consideration under the Humanitarian Assistance Federated States of Micronesia (HA-FSM) program, as well as material and equipment requests submitted under the US Excess Property scheme. Along with appropriate staff, the FSM delegates to the meeting included Secretary April Dawn Skilling of the Department of Justice, Secretary Francis Itimai of the Department of Transportation, Communications and Infrastructure, Deputy Secretary Samson Pretrick of Foreign Affairs, the FSM Consul Generals in Guam, Mr. Robert Ruecho, and the FSM Consul General in Hawaii, Mr. Kandhi Elieisar. Other State representatives included Lt. Governor Marius J. Akapito of the State of Chuuk, Mr. Pius Talemesei, Director of Budget and Mr. Vincent Figir, Director of Public Works and Transportation, of the State of Yap. The US delegation included Captain Mark H. Scovill, Chief of Staff of the Joint Region Marianas, Mr. Dave DeLeo, Compact Nations Country Director of USPACOM, Mr. Roy Tsutsui, Senior Political & Military Advisor of the Joint Region Marianas, and Mrs. Lynn Pangelinan of the US Embassy in Kolonia. The next JCM will be hosted by the United States in Honolulu. Consultation will be undertaken to determine mutually acceptable dates. 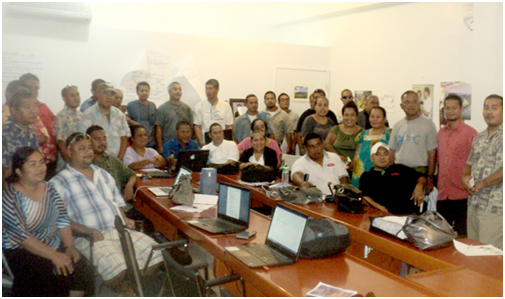 FSMR&D (May 26, 2014): On May 28, 2014, the Federated States of Micronesia (FSM) and other Member Countries of the Pacific Islands Forum will be participating in the 2014 Forum Trade Ministers Meeting (FTMM) in Tarawa, Kiribati. The theme for this year’s meeting is “Leveraging Economic Growth Opportunities through Trade Promotion and Facilitation Reforms”, in line with global efforts being made towards improving trade facilitation, and recognizing recent outcomes of the World Trade Organization (WTO) Ministerial Conference held in Bali in December 2013. The FTMM will discuss Pacific trade in the global context, core trade promotion and facilitation initiatives in the region, such as the Pacific Aid for Trade Strategy and the Pacific Islands Trade and Invest Network. The ongoing Trade and Economic Partnership Agreements that Forum Member Countries are currently engaged in will be carefully reviewed. It is anticipated that Trade Ministers will discuss the abovementioned issues and consider innovative options for enhancing trade promotion and facilitation in the region. For further information, call the Department at 320-5133 or email cmovick.fsmrd@gmail.com. 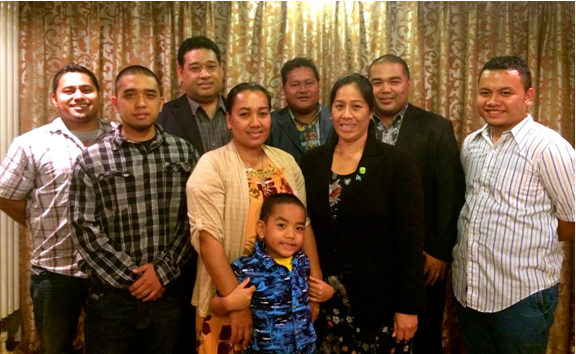 FSMIS (May 20, 2014): Today, the Federated States of Micronesia President Manny Mori received a visiting group of forty-six high school students representing schools throughout the FSM. The students spent time today familiarizing themselves with Leaders and Officials at the FSM National Government as part of the FSM Close Up Program for high schools. In the morning, the students observed at the proceedings of the Congress session and had the opportunity to interact with the law-makers of the country. This afternoon, they engaged in very lively interaction with the President who seemed to be just as delighted as the students themselves. The students probed into President Mori's view on what would happen to the FSM after 2023 when financial assistance under the Compact of Free Association with the United States are terminated. The Students also asked about motivating factors that led President Mori to where he is now, and about what he intends to do after he retires from office. President Mori told the students that he does not know what would happen to the FSM in 2024 onward. However, he said that the FSM must build its economy in specific ways that will assist in filling expected financial gaps when Compact funding ends and work on lowering its dependence on foreign assistance. He also said the governments (State and National) need a "healthy and well educated workforce" that must build upon current endeavors. In terms of his retirement intentions, the President said he would like to remain in the country and assist, especially in financial matters, given his banking background. President Mori also asked all the students to move on to college and stay focus on completing higher education before choosing to "settle down". The students, along with chaperons, came from all of the four states in the FSM. They will be in Pohnpei the entire week, under supervision from staff of the FSM Department of Education. The National Close up program is funded by the FSM Government to provide hands-on learning and interaction opportunities between Government Leaders and students. The 2014 Close up experience is facilitated under the theme: "Education in the Digital Era". For further information, contact the Department at 320-2609 or email fsmpio@mail.fm. On April 28, 2014 at 2:00 pm, a historic event took place when the Federated States of Micronesia and the Republic of Singapore signed an Air Service Agreement (ASA), enabling airlines of each country to freely fly in each other's air space. Signing on behalf of the Government of the Republic of Singapore is Minister of Transport’s Lui Tuck Yew and on behalf of the Government of the Federated States of Micronesia is Secretary Francis Itimai, Department of Transportation, Communications & Infrastructure. The ASA was first proposed by FSM to Singapore in February of 2013 and months ensued with negotiations between the Civil Aviation Authority of Singapore and FSM Department of TC&I. On February 2014 the agreement finally took shape and amicably agreed to by both sides. The signed ASA underscores both county's commitment to establish a fully liberal air service framework that will allow air carriers of both countries to react quickly to market demand when opportunities arise. This event is part of FSM's recent endeavors in diversifying the transportation sector to widen options for transiting travelers and those interested in parts of the FSM as a destination. The signing was witnessed by Mr. Nelperson Etse, General Manager of the Pohnpei Port Authority, and Mr. Ron Reyes, Airport Manager, Pohnpei Port Authority. Mr. Yap Ong Heng, Director General of the Singapore Civil Aviation Authority and other officials from the Civil Aviation Authority and the Ministry of Transport witnessed the ceremony on behalf of the Government of the Republic of Singapore. For information, email the fsmpio@mail.fm. In disaster management efforts, a workshop entitled, “Disaster Response. Significant Vessel Grounding – Ping Da 7” was held at the Tuna Commissions annex building on Thursday, April 24, 2014 that included state and national officials and other regional authorities. To shed light on the full scope of current status of Ping Da 7, the capacity building workshop examined different facets in identifying the precisions on what steps could be used as a vehicle of moving forward with the removal of Ping Da 7. Using a framework that will initiate certain measures in working with innovative solutions, comparative lessons and preparedness planning were also discussed around the roundtable. Designed to increase awareness, regional authorities, leaders and participants voiced their concerns regarding preventive measures by carefully examining the environmental conditions and situation at hand. The Ping Da 7 incident is considered both a High Risk and High Value because of the size, unfamiliarity of the area and the damage it can cause to the Pohnpei Port and the pristine natural resources. Responders were vigilant to understanding of the vessel grounding impacts, “This is a wake-up call for all National Government and State Government because we haven’t dealt with this, especially Pohnpei State,” said Lieutenant Governor Marcelo K. Peterson. The State Government is initially the first to respond to such incident -- the extent of National Government involvement is upon request. By sharing responsibility, the National and State Government have both taken a collaborative approach to proactive readiness and bridge advances of the Ping Da 7 incident. Francis Itimai, Secretary of Transportation, Communication and Infrastructure (TC&I) confirmed that this is not the first removal of a large vessel to take place, but the first to pull together as a joint task force. The FSM Congress appropriated $2 million to the response of this emergency. Weno, Chuuk…. On Friday, May 2, 2014 in an oath taking ceremony held at the Chuuk State Supreme Court, the Floor Leader in the House of Representative of the Twelfth Chuuk State Legislature, the Honorable Marius Akapito, took his oath of office to become the 7th Lieutenant Governor of Chuuk State, filling the role that was left vacant after the untimely passing of the late Honorable Lieutenant Governor Ritis Heldart on January 4th 2014. The solemnity of the oath of office to the new Lieutenant Governor of Chuuk was administered by the Chief Justice of the Chuuk State Supreme Court, The Honorable Camilo Noket. On April 14, The Honorable Governor Johnson S. Elimo transmitted his nomination of Mr. Akapito to the House of Senate pursuant to Article VI, Section 11 of the Chuuk State Constituion, which sets the selection process in an event the office of Lieutenant Governor becomes vacant. In his nomination letter, Gov. Elimo explained that Mr. Akapito does possess the necessary qualifications for the office of Lieutenant Governor by highlighting the nominee’s capacity as a parliamentarian who is familiar with the current issues facing the Sate of Chuuk. Gov. Elimo also pointed out that his nominee also possesses necessary understanding of the government framework for a constitutional system, such as the system being applied by the Chuuk State Government. After a thorough review of the nominee's credentials, the full Senate unanimously approved the nomination on the 23rd of April. In his oath taking remarks on May 2, Lieutenant Governor Marius Akapito said he will assist the Governor to continue the implementation of the infrastructure development plan for Chuuk State and the municipalities. Lt. Gov. Akapito also expressed his heart felt and big thank-you to the Governor and Members of the House of Senate for their trust and confidence rendered in his appointment and confirmation. The Honorable Gov. Johnson Elimo underscored in his remarks that the problems and challenges facing the State remain outstanding. He said overcoming these challenges requires the cooperation of leaders and the people. The Mayor of Weno, the island capital of the State of Chuuk, The Honorable Bintas Keneth, echoed the same, referring to the theme “ one mind, one work, one heart” with dedication and patience. Leaders of Forum member countries meeting today in the Cook Islands agreed to reinvigorate their efforts towards regional cooperation and integration under the Pacific Plan. Attending the Special Leaders Retreat, Leaders considered the 2013 review of the Pacific Plan, led by the Hon Sir Mekere Morauta, former Prime Minister of Papua New Guinea. Leaders expressed their appreciation for the comprehensive work of Sir Mekere Morauta and his review team. The current Chair of the Forum, President Loeak of the Republic of the Marshall Islands, welcomed the productive discussions and outcomes of the meeting. Speaking after the meeting, Prime Minister Puna of the Cook Islands emphasised the importance of political leadership discussing the challenges and opportunities for region. The Secretary General of the Pacific Islands Forum Secretariat, Tuiloma Neroni Slade, welcomed the outcomes of the meeting. “This is an important moment for the region. Once again, Leaders have demonstrated their commitment to regionalism and to working closely together," he stated. Leaders agreed to a number of ways to strengthen regionalism and priority setting, including further consultations with countries on the development of a Framework for Pacific Regionalism, replacing the Pacific Plan Action Committee with a small, specialised sub-committee of the Forum Officials Committee – the governing body of the Forum Secretariat – and looking at how to rationalise the range of Ministerial meetings. Leaders’ are expected to make final decisions on taking the regional agenda forward at the 45th Pacific Islands Forum to be held in Palau from 29 July to 1 August 2014.